What's the difference between conservation and restoration? Restoration as traditionally practiced, focuses its efforts upon returning an object or work of art to the object’s original state, an assumed condition, or an earlier appearance. In order to obtain these states, conditions, or appearances, often little regard is given to the historic “in-use” alterations and/or changes caused by the passage of time. In other words, restoring an object to its original state often erases the physical historic markers of an object's use by significantly altering physical evidence and original materials. However, in the past 40 years, the restoration of art and historic cultural artifacts has evolved and developed into the profession of art conservation. Conservation of art and cultural property is an interdisciplinary approach which incorporates art, historic research, scientific analysis, and material science to document, stabilize, and preserve historic artifacts. Art conservation focuses on the stabilization and preservation of an object using preventative measures to inhibit on-going or future deterioration of the object or its components. This is accomplished by selecting methods and materials that, to the best of current knowledge, do not adversely affect the historic or artistic object’s original materials. Ideally, conservation treatments will not impede future examination or scientific analysis nor adversely impact future treatments or functionality of the object. Infographic: The difference between conservation and restoration. 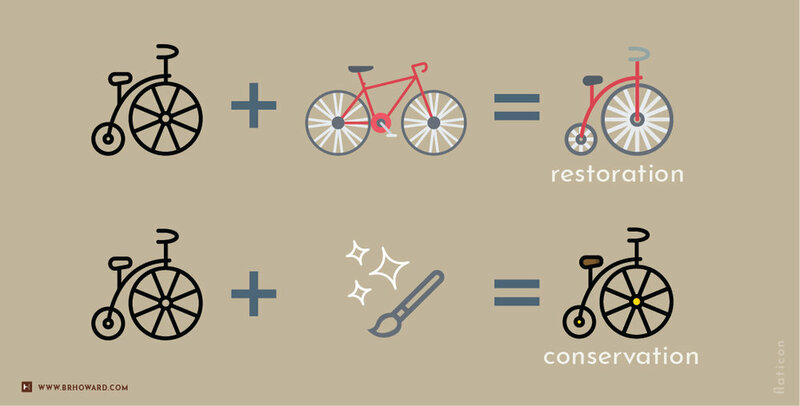 In the infographic example above, you’ll see that restoration and conservation begin the same - with an object, painting, or cultural heritage piece in its current state - for example, a historic bike. Say someone were to swap its tires with a new bike’s tires, paint it with some modern paint, and replace the seat with a new one. We would call this restoration. There is not much historical integrity left of the bike. The materials were altered, replaced, and forever altered from non-reversible paint products. However, say this bike were gently cleaned with appropriate solutions, areas of scratching were in-painted with reversible paints, and the seat repaired with historically accurate leather. We could then say this bike was conserved properly. The historical integrity and story of this bike remains and is an accurate depiction of what this bike would have been like in its day.